This beamline is served for monochromatic data collection for routine protein crystallography. The optics consists of standard components for bending magnet beamline such as BL40B2. The designed glancing angle of the vertically bent cylinder mirror is from 0 to 5 mrad in a downward direction. 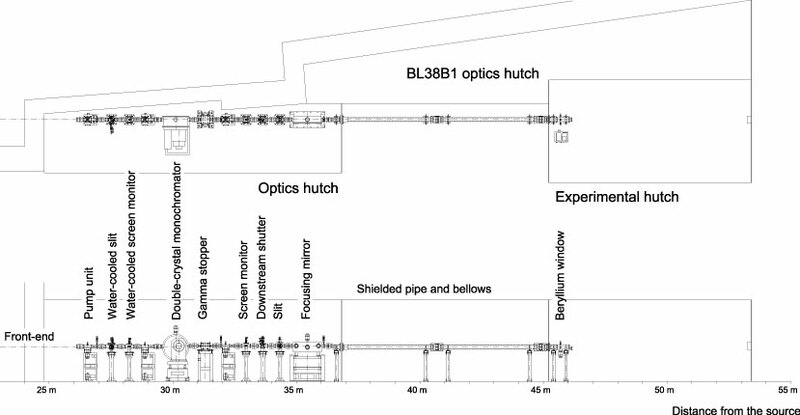 The Rh-coated 1-m-long mirror focuses the beam at the experimental hutch with the glancing angle from 3 to 4 mrad, while the cut off energies in the angles are from 22 to 17 keV. The calculated horizontally acceptance of the beamline is about 1.5 mrad and that of the mirror is from 0.7 to 0.8 mrad. Please note that each e-mail address is followed by "@spring8.or.jp."